COMPETITIVE NMI weightlifter Angel San Nicolas will travel to Manila, Philippines to compete in the inaugural Hidilyn Diaz Open Weightlifting Championships. 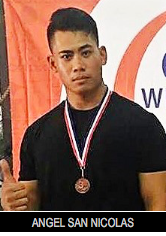 San Nicolas, who trains out of Latte Built Fitness has been competing in weightlifting for a few years but most frequently in Guam-based events. He recently received a personal invitation from Coach Drachir Ostoga of the Philippines to compete in the Diaz Open representing Ostoga’s Pep Project Team. The two had been following each other on social media, such as Facebook and Instagram, for the last several years and became good friends. Ostoga would regularly offer San Nicolas training advice and tips on lifting technique. Ostoga himself is a decorated competitive weightlifter who competes in the Super heavyweight 105kg+ category. He is the Philippine’s national junior and senior record holder, a South East Asian Games medalist and Asian Junior Championship finalist. Ostoga is also currently enlisted in the Philippine Air Force. The Diaz Open is named after female Olympic weightlifter Hidilyn Diaz who took Silver in the Women’s 53kg category at the 2016 Rio Summer Olympics in Brazil. It was the first time that the Philippines had won an Olympic medal in 20 years. This year’s competition takes place at the Meralco Fitness Center’s Multi-purpose Hall in Metro Manila. “Coach Ostoga is a training partner and close friend of Hidilyn. I shall make the most of this rare opportunity. I’m going to use it as a gauge to assess where I stand in the future of my weightlifting career,” San Nicolas told Variety. Outside of weightlifting, San Nicolas spends his time teaching and mentoring special needs children and races competitively for the MOC outrigger canoe club. San Nicolas will be competing in the 94kg category at the upcoming event. He leaves for Manila this coming Thursday and the competition runs from July 8 to 9.